It’s not complete, but it seems to work well enough for me. I’ve added a new tagging infrastructure, and I’ve spent some time learning how Rail’s test system works. At the moment, I’m populating the tags via the keywords field–that lets me edit them directly from Ecto. I’m going to extend Typo’s built-in admin interface to show a keywords field for now, but not add a method for directly manipulating tags. 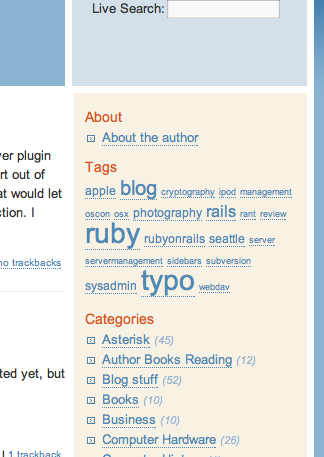 Later, I’ll come back and add del.icio.us-like autocompletion and a way to rename and merge tags. I haven’t bothered merging my tags into Technorati or anything yet. So far, they’re just an alternative to categories; we can look at interactions with other sites once tags get merged into the Typo trunk.